In celebration of the Swank Zine Tea Pot re-issue deck, we'll be hosting the Zine Thing Party with Thrasher Magazine this Saturday, May 31st at TFR Gallery in Leucadia. Lots of legendary zine publishers, skaters and artists will in attendance. See you there. Thank you for your support of this event Vans. Joey Ragali pops a lofty switch ollie in Transworld Magazine's SIGHTINGS post. 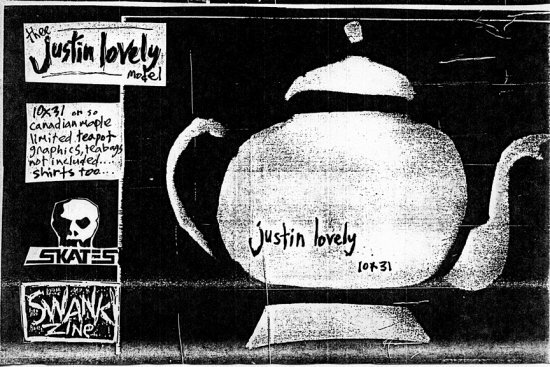 It's got teapot graphics that don't matter, great. This is a limited re-iiue deck that comes with a copy of a Swank Zine made by that pisshead of a skater himself, Just Lovely. Oh no. Swank Zine board up for grabs here. Thrasher Zine Thing Party to celebrate the re-release of this deck, May 31st! Also....for your viewing pleasure. Here's a digital issue of a 1984 copy of Swank Zine with Neil Blender on the cover. Click here to read. Joey Ragali talks about becoming our newest AM, top Floridian shredders, and living in a closet in this interview on Thrasher Magazine by Ben Karpinski. See the full interview and photos here. All Photos shot by Ben Karpinski. Thrasher Magazine kicks off Shep Dawgs Vol. 4 week with the opener to the vid, Taylor Smith aka T-Spliff!! Hell ya Taylor, congrats on putting together an insane video part! Last Friday we threw a surprise party for Joey Ragali welcoming him to the Foundation Super Co! Here's a welcome edit filmed and edited by Don Luong, exclusive to Thrasher Magazine. Congrats Joey, welcome to the F!! Huge thanks to Fred Water for helping out with the celebration. Drink Fred! One Way Boardshop team rider Anthony Anaya has an interview up on the Foundation Secret Society site. Click here to see it. T-Spliff aka Taylor Smith comes through with a proper Firing Line on Thrasher Magazine.